Do you sometimes look at your existing content and feel as if it deserves some extra attention? Would you love to get more exposure for some of your most outstanding blog posts? See a spike in new traffic to old content? Then this is for you! Here are some rather simple ways to give new life to your old and existing content. These methods are open to everyone and nothing fancy. Just things that have worked for us to give some of our already existing content a new spike in traffic! This sounds rather stupid or basic – but believe me, it is not! I assume you know by now that you can and should tweet your evergreen content more than once. In fact, I recommend that you set up recurring queues for your awesome and evergreen blog posts so that they earn consistent clicks from your Twitter audience. In addition, I hope you are not making the one crucial mistake that is costing so many Twitter users the majority of their traffic chances: Tweeting not often enough. What I am talking about here is to actually make a completely new tweet. In the past weeks, I went through all of our tweets in the Twitter queues – all tweets that we regularly send out. And I realized something important: In the past couple of years, I learned a lot about headlines and what tweet texts work well – and which don’t. So, today I pride myself that most of the tweets I create get far more attention than some of the tweets I created back in 2015 or even 2016. And if you are anything like us (and millions of other bloggers) you probably create much better converting headlines and tweet texts today than you did a couple of years ago. So, if you are still tweeting some of your older blog posts, because they are still absolutely relevant, I recommend to re-visist all of them and create new tweets: Put in all your expert knowledge about headlines and tweet texts and the perfect Twitter images and you will earn more clicks and engagement from the same amount of tweets (and followers) on your Twitter account. Simply because you created a much better tweet. Here you can see buffer statistics. 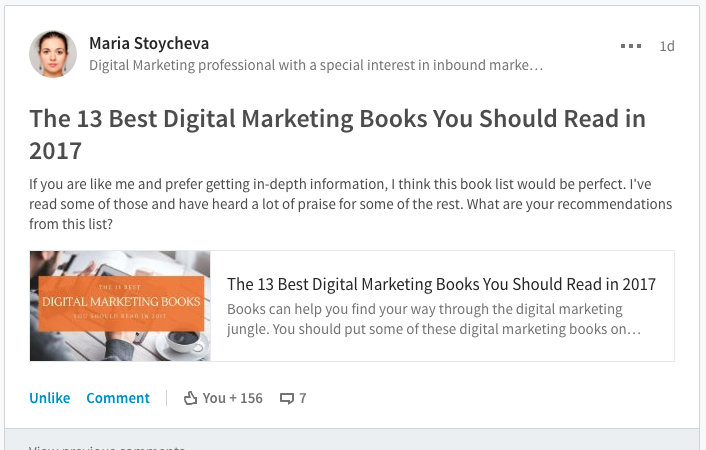 The post is a list of books so maybe one of the mentioned authors shared the list on their LinkedIn feed? – No not that. Maybe another influencer shared it for some reason? I could not find anything. Maybe someone with huge impact mentioned the post in a post he/she published on LinkedIn? No again! Could all this come from a LinkedIn Group? Really? Strike! I am not very active in LinkedIn groups – although I have been a couple of years ago when we were still running our startup exploreB2B. I have seen some traffic spikes like this one from LinkedIn groups before. And they always come from a similar way of sharing content. The Screenshot was taken in the middle of the traffic spike. The post acquired far more than 200 likes. And if you have ever been active in a LinkedIn group you may have noticed that even getting more than 10 likes on a shared piece of content is a lot in most LinkedIn groups. So, do I really believe you can reproduce some similar effect for your content? Yes, I do. Because I have seen it before. And it follows a pattern. And while there is no guarantee that your post gets the attention you are seeking, you can make sure that you do your best to help it get started. Don’t simply spam every group with a link to your content without planning how to do it. Don’t just try to get people to click – open the conversation. Use the content as a starting point and ask questions. Use content, that is of broad interest. It is not one of our posts – so I cannot give you any traffic stats for this one. I once produced a spike in traffic for a piece of content called: „If Content is King Who is Queen?“ That question produced so much engagement and answers, the group post stayed active for quite a while and got us a huge spike in traffic for a couple of days. So, while you are not building a loyal audience in LinkedIn Groups and many of the groups are not the most communicative place you can find, there is a lot of traffic power hidden in the chit chat and spammy content shares. It sure helped that Adespresso is a high traffic outlet. But you can produce your own little traffic spike to your awesome content by curating some of your evergreen and still awesome posts into a new post. To share that new post for more traffic you have endless options. You can either publish it on your own blog – and share the hell out of it! 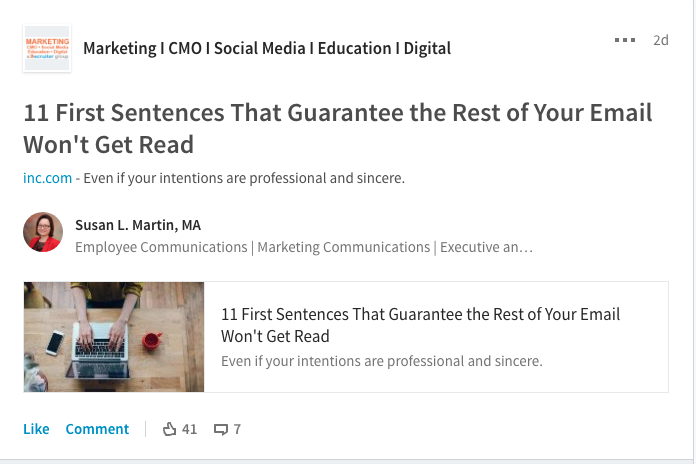 Or you can use other outlets like Medium or LinkedIn Publishing to publish this new post that is filled to the brim with links to other content on your blog. While your new post may not produce as much traffic to your old content as the Adespresso post did for mine, you still have the chance to earn some significant new traffic to the new post – and the curated posts as well. You can send the new post to your newsletter subscribers. You can share the new post on social media and sites like StumbleUpon. The new post will also have a postive SEO effect, either for a link from the new outlet (Medium or other) or for interlinking your content on your website. You can even do new SEO for the additional content. It is all there for you to earn more traffic. 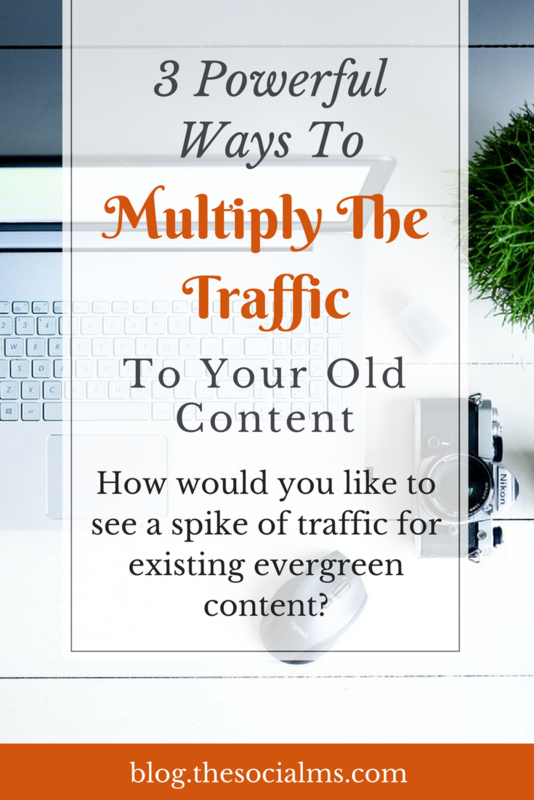 There are endless ways to repurpose old content or bring new traffic to them. I hope you found some new ideas in this post that you are not already doing. If you are using some other awesome methods to revive your evergreen existing content – please share them with us! We would love to hear about your creative ideas! 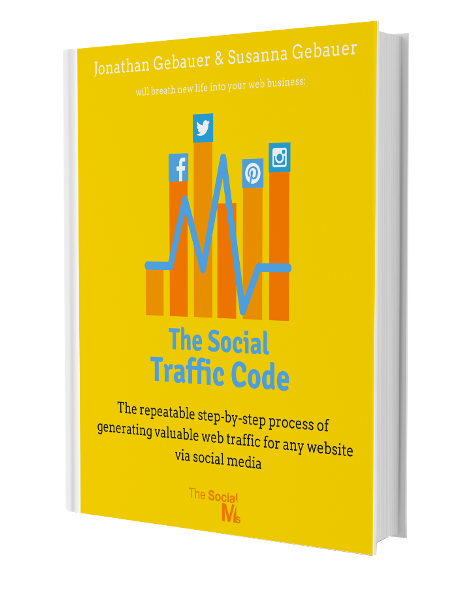 Do you want (more) free traffic from Social Media? We teach you how we grew our first business from 0 to 500k page views per month with social media and how we got 50k visitors per month from social media to this blog after 6 months. We show you the exact steps you need to take to see the same kind of traffic success.